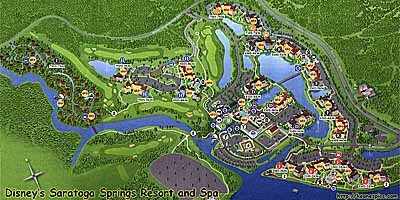 I try to stay at a different resort every time I'm at Disneyworld, and my October 2007 was no exception. It didn't hurt that there was a $100 dining card as a perk to Annual Pass holders. That rule was broken a couple of times in 2011, including a stay here when I was a pseudo DVC member, and rented points from a friend. 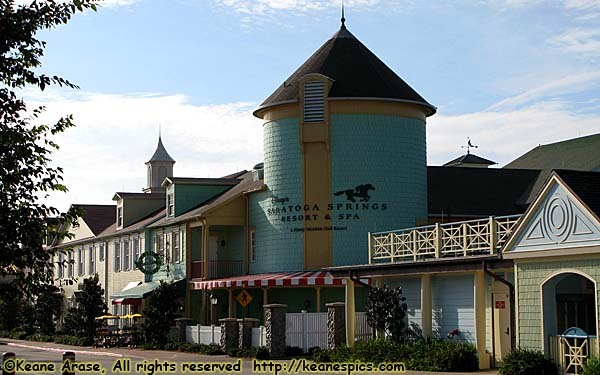 Saratoga Springs is themed to...Saratoga Springs, New York! Shame on me, I didn't even know a Saratoga Springs existed. My apologies. Anyway, I didn't care. I've yet to be at a Disney resort that didn't beg to be photographed, or explored. It's a picturesque resort, just a little big. SSR is indeed a DVC resort, so all the rooms here are villas. I had a studio in 2007 which comes with a 10 cup coffee maker, microwave, and a larger 'fridge. In September 2011 I had a dedicated 2-bedroom villa (with an accessible bedroom), which came with a full kitchen, two bathrooms, a washer and dryer and a whirlpool tub.